My income breakdown for December 2011 to help you understand the important aspects to making money online in 2012 and see how the equation is changing in future? November 2011 is when I shared my first income statement publicly and it has been more than a year now and so I thought I will share my income statement once again and see how the progress has been so far and share some very important aspect to understanding online money making game in 2012. How the equation is changing and what to expect in future? In the Month of December 2011 my total income online was $6853.82. The breakup of my income is as follows. Comparing the above data with October 2010 numbers there are some key differences. You may have already read in public forums that AdSense does not work any more. From the above chart you may draw the conclusion that AdSense is working for me and yes it is working for me in 2011, you need to understand how to make it work. So let us look at some numbers. In October 2010 AdSense was 37% of my total online income. In December 2011 it is 22% of my total income. Though I am not allowed to share specific figures as per AdSense TOS but based on gross numbers, you can see there is an overall decline in AdSense income where as the traffic to my sites is at all time high. (See here). This means AdSense is either paying less or I am not sending as much impressions to AdSense as I was sending previously. The reality is, as AdSense revenue is not increasing in accordance with traffic, I am sending fewer impressions to AdSense. Coming back to public forums, there are webmasters who do not see growth in revenue despite growth in traffic and then they post such comments like AdSense does not work anymore or death of AdSense but now you know the REAL reason for such comments. I do agree that those comments are true but not the complete truth. You can combine AdSense with other Ad networks to make AdSense work for you. Combine AdSense and CPM Advertising from the above chart and you will see a growth in revenue pretty much inline with my traffic growth. If you rely too much only on one Ad network like AdSense, you will not see much growth in revenue. Look for other methods to monetize your sites as you grow your site. Webmaster’s should always experiment and my experiment of moving from Kontera to Vibrant Media increased my content links income from 2% to 5% of my total income. I had my doubts when writing my eBook for Indian audience but this was yet another experiment that has worked really well for me in 2011. My Technical Analysis eBook has contributed lot to my affiliates and products part of my total income. December was yet another month where I had lot of consultation work coming my way and so it becomes considerable chunk of my total income for yet another month in 2011. Partnerships are one thing where I had very little focus in 2011 and the highest priority in 2012 will be to focus more on partnerships. Product and Affiliate incomes are growing faster than my expectations and this will be yet another area of focus for me in 2012. 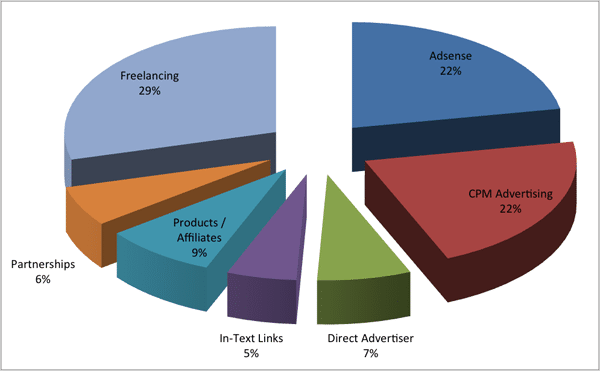 I have not added much to my direct advertising sales in last one year and thus it remains roughly the same. Thanks to my long-term advertisers but this also means I need to focus more on getting more direct advertisers. In 2012 I will be focusing less on freelancing, consulting and more on partnerships where I can form teams / companies to make more and more money online for my team and me. If you want me to be part of your online venture, do let me know here. I don’t prefer doing that because that would not reveal anything fruitful. What is more important is how to make such money yourself by sharing the ideas of what you can do today. Few things that worked for Go4Expert in 2004 to 2012 may not work if you start now. Are you telling that it is very difficult to earn money with a forum or a blog now? You have mentioned that “how to make such money yourself by sharing the ideas of what you can do today.” What does it mean? Are you refering that I have to input my ideas to make money…..IThe ideas you have tried will not work out…Will you help me once I get a domain name? No what I meant is what I did for my website in 2004 may not work in 2012 and there are lot of things that has changed and so you should be doing things for now. As a simple example when you have a new domain you need to wait for 6 months before you can apply for Adsense now but in 2004 site was making almost its hosting cost in 6 months. So if you are starting now, you should plan differently than in 2004. On top of that if you look at SEO has changed as well. So the idea is to share things how you can start now and make the same impact and not focus on what that site makes. Regarding help, I tried calling you but did not see any response from your end and so not sure what kind of help you are looking for but if you want my inputs, I am always open to it. Hi Karthick, The best place to learn SEO is SEOBook but you can take maximum out of that if you have some idea about SEO and how it works. So I will suggest you to use forum and Google to understand basics of SEO and then you can opt for SEOBook. I saw a new webhoster called Ipage and I think it is better than BlueHost….Can you please tell me the diffrence? Can you suggest which is best? Karthick, Yes you can use your same Adsense account on any site that is within the TOS. The earnings that you have mentioned are only from this website ? or do you have many more ? From only this website ? What do you mean by this website?